Located in the west of China, Tibet is a land of lofty heights and religious significance. 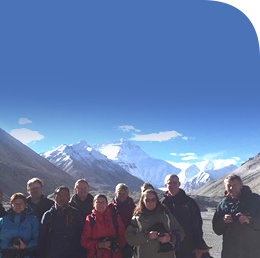 Also known as "the roof of the world", the Tibet Autonomous Region provides a unique perspective of China to all the tourists. Attracted by its natural wonders and historic culture, every year numerous tourists at home and abroad travel to Tibet. When traveling to Tibet, you not only see the breathtaking mountains and valleys but also visit the ancient Buddhist Temples and Monasteries which are the masterpieces of arts and culture. In Tibet, you have lots of things to do including climbing the world highest peak, pilgrimaging to Mount Kailash, visiting the Potala Palace, and enjoying the beautiful scenery of unique valleys. And the best time to travel to Tibet is from April to October when the weather is appropriate and the natural beauty of Tibet are at the climax. If you wanna explore the deep cultural beauty of Tibet, you shouldn't miss the fantastic cultural cuisine. Due to the arid climate and high elevation, the diet of Tibetan is quite different from that in other parts of China. Yak play a significant role in Tibetan diet. Meanwhile, the food items like yogurt and butter are the common dishes in Tibetan dining table. If you wanna taste the traditional Tibetan cuisine, don't miss the tsampa, yak butter, yak yogurt and raw yak meat. It will be an unforgettable experience for your Tibet travel if you explore Tibet in the festival because there are many unique festivals in the region with strongly Buddhist culture. In Lhasa, the capital city of Tibet, there are annual festivals including the Tibetan New Year and the Shoton Festival. There are also some minor festivals associating with the monasteries and the local traditions. Taking a trip to Lhasa, especially during a festival period is an excellent way to explore Tibet. Though Tibet seems to be unreachable and mysterious, it is not difficult for tourists to get to Tibet. Tourists can get to Tibet from the mainland of China or Nepal. Traveling to Tibet by air is considered as the most convenient way. You can take direct flights from Kathmandu, Npeal to Lhasa or fly to the mainland of China and take the connecting flights to other cities of Tibet. In addition, taking a train to Tibet is a popular way for tourists who wanna see the beautiful landscape of Tibet. Presently, there are five direct Tibet trains carrying tourists over Qinghai-Tibet Railway. And tourists can also explore Tibet by road because there are five Tibet highways leading to Lhasa from different directions. When carrying a travel to Tibet, you may figure out what documents you needed. Unlike traveling to other places of Tibet, Tourists who wanna travel to Tibet need a Tibet Travel Permit which can be applied by a local travel agency in Tibet. Except for Tibet Travel Permit, A China Visa is necessary for foreign tourists. However, if you travel from Kathmandu to Tibet, you need to apply for a group visa rather than China visa. Can Americans Travel to Tibet?